Before I get into a lengthy story about what you see here, I'd just like to state, for the record, that The Stallion and I were back to our usual antics last night. We sat on the couch. We had a miscommunication that resulted in The Stallion making dinner for only himself and me being crabby and whiny the rest of the night. As if I really wasn't going to eat anything. Also, for the record, I never stated that I did not want dinner. That's what he heard. But he wasn't listening. My point is not that I was right and he was wrong (although I do believe I have made that point - on accident). My point is that I want to be sure none of you think I'm so young and naive to think that our relationship is all rainbows and bunnies. Yes, we did have a great time the night before; yes, we love each other very much; yes, we are soul mates and will never part; no, we are not always perfect. Now that that's all cleared up, let's talk about champagne people! I remember vividly the first time he made one of those for me. I never knew that this was a talent he possessed until he was tasked with making a wire sculpture to be auctioned off for an arts benefit. He pulled one of these out (unshaped) and asked me what the guy should be doing. He wanted to 'warm up' for the life-size sculpture and get the creative juices flowing. I didn't really comprehend the concept. But I told him he should have the guy peeing. Because we were still new and I wanted to be 'cool' and 'funny'. He didn't really like that idea. What he made is the reason I remember this so well. When he was done, he presented me with a man on one knee, holding a flower. It was the first really sweet, romantic thing he had done for me. The first thing he did that told me he really liked me, in contradiction of his initial warning of 'I like going out with you, but I don't want to be serious right now'. Pffft. I decided right then and there, on his couch in his living room, staring at that man, that that was going to be how he proposed to me. With a champagne man on one knee, holding a ring. While it was a great idea, we all know that's not how it happened. The way it happened was so much cooler! 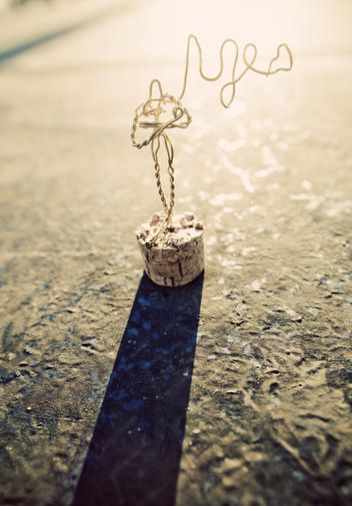 I used to have a champagne topper band sitting on the kitchen windowsill - it would grow by the week. Soon we were out of ideas for musicians to add to it. The Stallion donated that to the following year's art auction benefit. He never replaced it like he was supposed to. But I've got a couple others on my windowsill that are much better. I've never tried to make one myself, but I know I will one day - I already have that plan. And I'm confident I'll be able to make what it is that I want to make. You should try it next time you have a bottle of champagne! Or a big bottle of beer - those tops work, too.